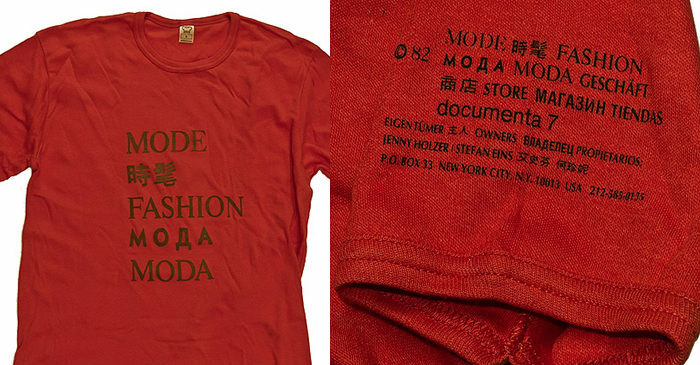 Fashion Moda at documenta sign, 1982. The downtown art world of the 1970s and ’80s was mostly separate from the established uptown galleries where works sold for high prices to the art elite. Downtown was a low-budget affair, a place where artists exhibited in shabby do-it-yourself spaces that catered mostly to other young and broke artists. It was a milieu that encouraged new forms of populist art; inexpensive multiples that anyone could appreciate and afford. Examples of this type of art could be seen at Stefan Eins’ 3 Mercer Street Store (1972-79), later at his Fashion Moda space (1978-93), and at the pop-up A More Stores (1980-84) sponsored by the artist group COLAB. Christy Rupp, Rat Shirt, 1982.